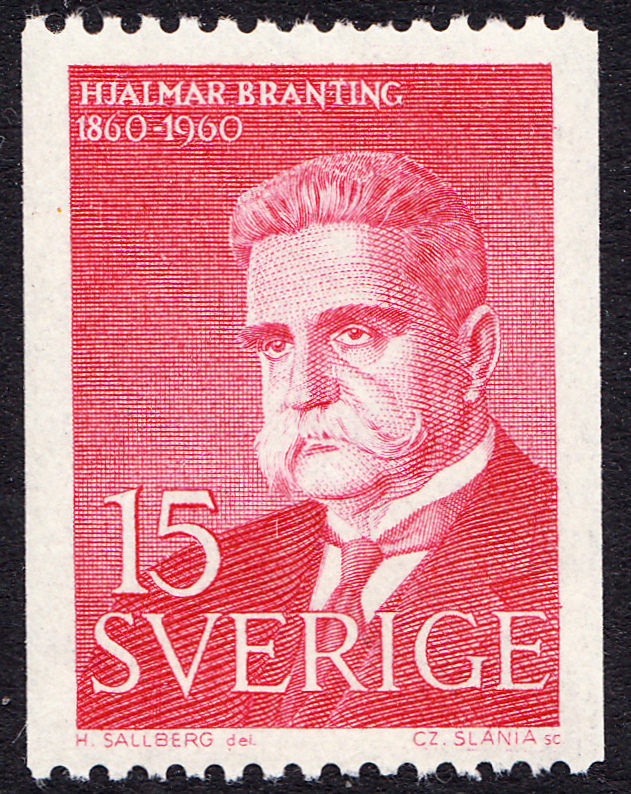 Karl Hjalmar Branting was a Swedish politician born on 23 November 1860. In fact, to say he was a successful politician would be somewhat of an understatement. He held the position of Prime Minister of Sweden not once or even twice, but three times (1920, 1921–1923, and 1924–1925)! Not only that, he was the leader of the Swedish Social Democratic Party from 1907 to 1925. Interestingly, Branting's career didn't begin in politics. Branting attended Uppsala University in Stockholm, where he studied mathematical astronomy. He even worked as an assistant at the Stockholm Observatory. But in 1884 he gave up this burgeoning career to work as a journalist. It was in this capacity that he published an article written by the radical socialist, Axel Danielsson. This landed both himself and Danielsson in prison. Branting eventually served three months in prison in 1888. 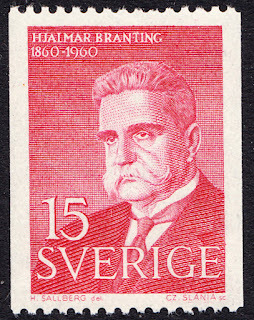 In 1889, a year after his incarceration, Branting's career focus shifted yet again when he became one of the main organizers of the Swedish Social Democratic Party. And he was the first member of this party in Parliament from 1896. From this point he never looked back and went on to have a stellar political career. In 1921 he was awarded the Nobel Peace Prize for his work in the League of Nations, sharing the prize with the Norwegian Christian Lous Lange. 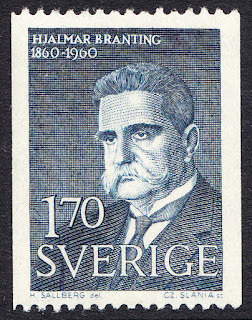 Karl Hjalmar Branting died on 24 February 1925. 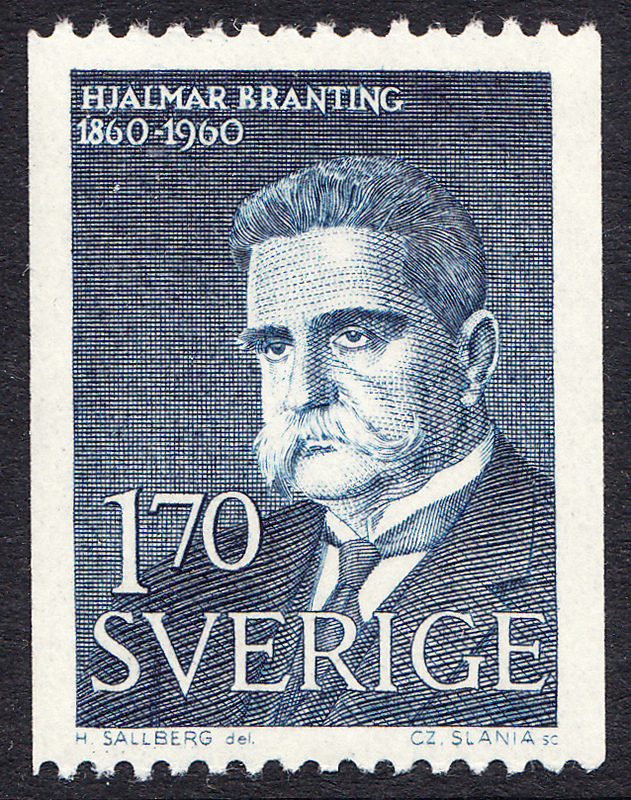 On 23 November 1960 Sweden issued a set of two stamps to commemorate the birth centenary of Karl Hjalmar Branting. The designer of the issue was H. Sallberg. Czeslaw Slania was the engraver. 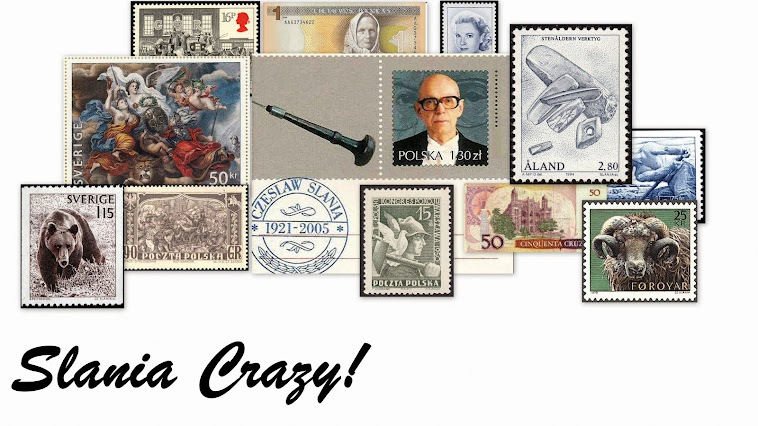 The issue consisted two stamps of the same design in two values - 15o and 1,70k. The issue was printed in vertical coil format (pictured below) and booklet format. I have seen the portrait that this design is based on, and I must say Slania has done a superlative job capturing the details in this engraving. From the intensity of the eyes to the superb moustache this is indeed another great engraved portrait by the master.